In the previous century, technological development accelerated considerably, and consequently even the machinery used in industry followed this path of development. It should be stressed that, since the electronic and digital revolution of the 1970s, research and development of tools have accelerated further, giving rise to constantly changing markets. We are now in the heart of the fourth industrial revolution, called Industry 4.0, and having automated machinery in companies has become a necessity to overcome technical issues and speed up production. READALSO: "Progress of welding process: influence of Industry 4.0 in the welding industry"
According to the programmes of European Governments, over the next 10 years companies should become true smart factories where automation and smart machinery will be increasingly present alongside human operators. Continuing production with tools solely under human control means being unable to satisfy today’s market and that of the future, in terms of timing as well as customisation and quality of the product requested. Welding machines are essential tools for many companies, and continuing to use obsolete ones will, over time, be increasingly expensive and wasteful. Old-design welding machines will need to be replaced or adapted to new industry standards. In a world of industry that will use IoT (Internet of Things/Smart Objects) to gather data during production, augmented reality and network-connected machinery, it’s unthinkable to continue working with obsolete welding systems that will no longer provide acceptable results within a few years. 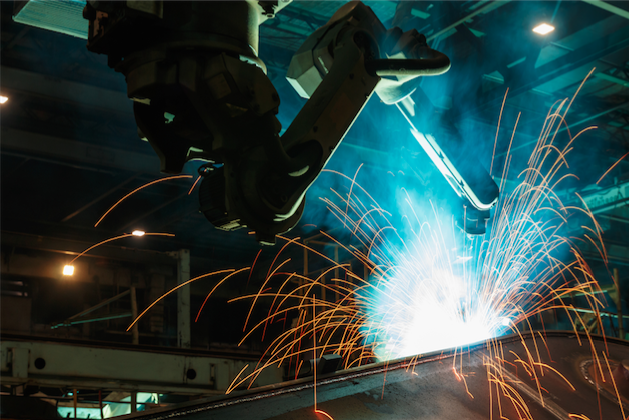 READ ALSO: "Welding issues today: 3 new factors to consider"
These advanced technologies will be used to make sure that robots can receive continuous feedback and independently review their own parameters to keep a high quality standard. All this translates to lower costs from the production process. Even today, robotic industrial welders, which, for instance, independently manage the settings for MIG welding, are far more efficient than a human operator. The solutions that the new technologies offer in the field of welding, have brought major improvements even in the work carried out with manual machinery. In factories using welding machines, but which cannot install robots, it becomes essential to have machines that facilitate the welder’s work. The new machines can, in fact, be fitted with synergic technologies and high-performance special processes. If we add to these the possibility of connecting all welding machines to a network, it is easy to see how constantly monitored work will be more accurate and optimised. Wasted time and material are welding defects that can hardly be solved with old machinery driven entirely by humans. Modern welding machines help avoid many of the common welding defects and speed up timing, thanks to pre-set functions that need only be selected. Do all machines need to be replaced? Reading the plans in support of industry 4.0 drawn up by the Member States, it seems that it is essential to change all the equipment present in the company. The process of replacing machinery is initially costly, but will yield clear results instantly and over the years. Where possible, we must retrofit robots already installed in production lines, so as to add latest-generation technologies to systems that need to be updated. With this solution, costs will be much lower. READ ALSO: "5 good reasons to buy high-tech welding machines"
Even small companies, which cannot afford huge investments, must nonetheless include a budget to replace old welding machines in their industrial plans, as they will increasingly be less efficient. Welding systems that are already in place can have MIG/MAG or TIG generators introduced, controlled by digital interfaces, which provide an instant technological leap forward for the company.